Sidi Bou Said is often called the St. Tropez of Tunisia. She competes for the title with another village presented below. Sidi Bou Said is distinguished by its peaceful calm if you go early. Besides its white walls, the village has many doors to the architectural ironwork and paintings treated, which gives beaucop de cachet. 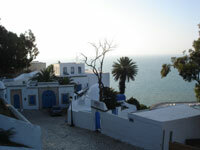 The village of Sidi Bou Said is one of the main attractions are. The view offers a superb panorama on the gulf of Tunis. Its typical market or it is advisable to negotiate you will admire the local handicrafts. Prices remain among the highest in the country, the class requires ... The village of Sidi Bou Said is named after a hermit Morocco, Sidi Bou, come stay on the hill in 1207. The ideal time to visit the village of Sidi-Said-Bous still very early in the morning, ideal for enjoying the walk through its deserted streets, where the sun strikes gradually each pant wall, giving the house colors and a unique luminosity. To return to the village, it's easy, just take the main street that leads to the center. In the top you will arrive at the foot of the Cafe of Mats, where some celebrities, such as André Gide, have benefited from his tea. Café Sidi Chabaane is the mythical place of Sidi Bou Said, numerous terraces overlooking the gulf of Tunis you ravirons. Beware of rush hour, it is better to arrive early too. But before you lose in the cafes, we advise you to get lost in the streets. After all, if you arrive early to Bous-Sidi-Said, it is not getting lost in the cafes of the village (but to each his thing ...)? Enjoy the beauty of Tunisian doors, mainly blue in Sidi Bou Said, but there are also yellow and white. You will notice their three handles, which formerly allowed to recognize the newcomer based on one used ..
En bas à droite : la femme et les enfants. 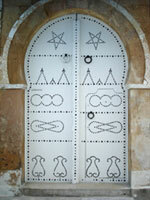 You can also visit the museum for example Dar El-Annabi. It is open every day except Monday. Features: art, clothes and traditions of Tunisia. 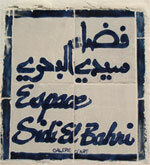 Or the Art Gallery of Sidi El Bahri. Sidi Bou Said is full of pleasant little surprise for the eyes, everything turns of alleys. Add to bookmark this page Tunisia " Sidi-Bou-Said visit " - Firefox do "Ctrl D"